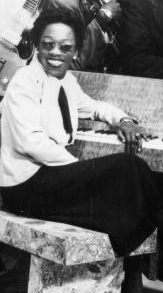 One of the first great pianists of rock, and the first great female instrumentalist (by quite a few years), Devonia “Lady Dee” Williams spent much of her career in the background as part of Johnny Otis’s stellar band of the late 1940’s and early 1950’s. But on occasion she showed she was comfortable in the spotlight recording a handful of vocals over the years as well as instrumental records under her own name. Williams was born July 18, 1924 in Los Angeles and with a background playing piano in both gospel and boogie woogie she was perfectly suited for the broad scope of black music that Johnny Otis envisioned for his nightclub, The Barrelhouse where he hired her for the house band, as well as to join him in his rapidly expanding recording career just getting underway. Over the next ten years she’d anchor the band alongside other stalwarts such as guitarist Pete Lewis, drummer Leard Bell and saxophonist Preston Love. Otis’s bands were always very democratic in their use of personnel as he enlisted multiple singers at any given time as well as featured soloists for instrumentals. Williams became one of the few who handled both roles, tackling some lead vocals – often under the name Darby Hicks, an elaborate in-joke within the band, as that was the name used to enrage new members when they were told that “Darby Hicks” was mocking their skills, their clothes, their looks and their choice in ladies each night until the newcomer demanded to have the non-existent loudmouth pointed out to them so they could settle things out back… only to find out there was no such person. Her primary role however was on piano where her dexterous playing enabled Otis to construct complex arrangements with interlocking rhythmic patterns which featured her keyboard work front and center. She also seems to have served as a test case for the band’s eventual move from local Excelsior Records in L.A. to the New Jersey based Savoy Records, as she cut her initial sides under her own name, as well as under the name of a non-existent group called The California Playboys, with various jazz musicians as sort of a mercenary band for the label in early 1949. Otis and company would sign with Savoy a few months later where they’d have their greatest commercial success as the ‘50’s dawned. Williams remained with Otis for years but her vocal opportunities dwindled as the congregation, as they were often called, began featuring permanent vocalists, notably Little Esther who handled virtually all of the female leads. Lady Dee however continued backing everything the loose-knit band of artists under Otis’s auspices did, both on stage and on record, moving with him from label to label through the mid-1950’s before he largely disbanded his original group upon his move to Capitol Records in 1957. Devonia Williams, the first female rock instrumentalist, as well as one of the best who ever played (not to mention one of the classiest), passed away in 1967 largely forgotten by history but not by those who were fortunate enough to hear her years of impressive work. As sideman… behind Joe Swift. As sideman… behind Johnny Otis. As sideman… to Johnny Otis.